Where are you going to get pumper kits? Someone was making them a while back but I don't remember who. For the time being, I'm using pumpers and diaphragms that I, errrrrr... my dad bought from Griffith Specialties in the '90s. Original pumpers pop up on eBay from time to time. Knowledgeable sources tell me that you can use BDC metering diaphragms if you fill in the duckbill hole with a plug of gasket material. As many already know, many older snowmobiles used those Walbro parts. 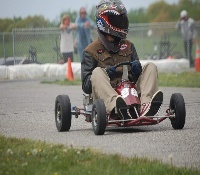 I haven't needed to go that route, yet, but I'm just wrapping up my rookie season of vintage karting: The time will come. Also, you may be thinking of sugarcreeksupply.net for repops: I haven't tried them either, but someone should give 'em a shot and report back. The possibly late, infamous, Wayne Havalin from Henderson Nevada had some "reproduced"....... I did get one kit & it worked fine. If enough interest I'm sure LAD would make a run of them if the numbers worked out.